Pouso Alegre is a pousada (ex-fazenda) which is very well situated 7 km away from the Transpantaneira, with water on both sides much of the way now in the rainy season. The location is 33 km south of Pocone in the northern Pantanal. The hole pousada is a great nature-area with original landscape and extensive cattle ranching. A paradise for the keen birdwatcher as well as for the beginner in birdwatching who approaches that pastime in a relaxing attitude. The owner is there much of the time, and is a dedicated naturalist. 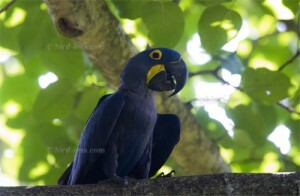 If you are birders you will be pleased with the birding opportunities, including Hyacinth Macaws in front of the porch. On the way you will see of Jabiru storks, herons and raptors a lot. You can go on other guided hikes or horseback rides. It’s all custom and small-scale. The scenery is beautiful. You can see an enormous variety of animals and birds but also the flora is wonderful. A list can be found at their website. Bird-lens was invited in the frame of an scientific project to monitor resident and migratory bird species in the Pantanal of Brazil. See also the blog here! More than 600 species of birds – almost a third of the avifauna of Brazil – have been detected in the wider area of the Pantanal, of which about 20% occur as migrants of wintering birds only seasonally. Among them are those from other neotropical regions like the Andes, but also from North America (Nearctic) and from the Southern region of Latin America (Australis). Although the origin of migratory species in most cases is known, there is still a lot of knowledge missing e.g. about the distribution patterns, feeding ecology and ecological niches, bioacoustics and metabolic physiology (eg moulting).